ESO Supernova Exhibition — When did the Universe start to shine? When did the Universe start to shine? 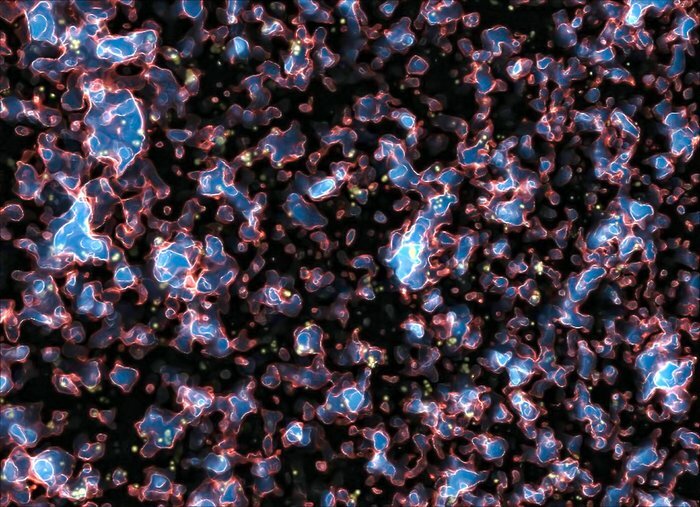 After the Big Bang, the Universe cooled down and grew dark. Only when dark matter and gas had clumped together did stars and galaxies begin to shine, clearing the fog and ending the Universe’s Dark Ages. 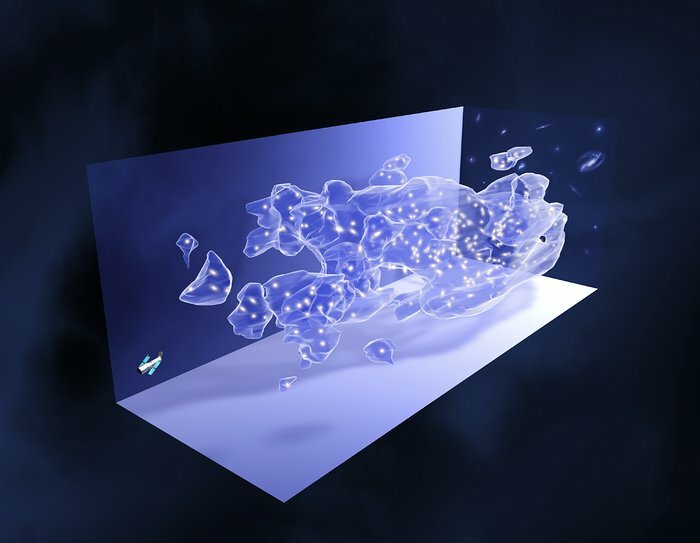 Dark gathering: Mysterious dark matter (depicted in blue in this 3D rendering) clumped together during the Dark Ages of the Universe, to create the early stages of galaxy growth. Clearing the fog: High-energy radiation from the very first galaxies started to ionise the fog of dark, neutral hydrogen gas that filled the early Universe. Because of cosmic expansion, the Universe’s hydrogen and helium gas became less dense and cooled down. 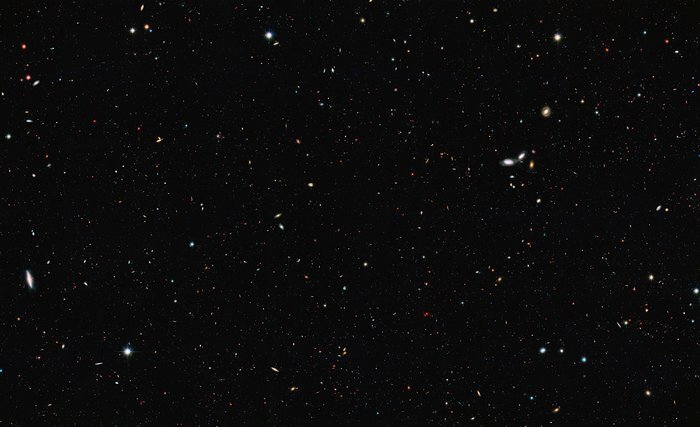 For hundreds of millions of years, light could not propagate over large distances in the Universe. During these Dark Ages, dark matter clumped together into the lumps that would become clusters and galaxies. Neutral hydrogen and helium followed, and after a while the first stars were born. 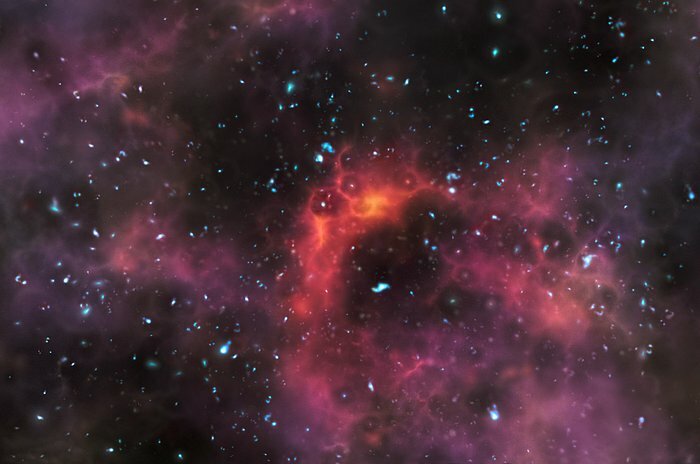 Energetic radiation from those stars – and from black holes in the cores of galaxies – reionised (ripped electrons from the atomic nuclei) the remaining cold, neutral gas in intergalactic space, and the Universe began to shine. Let there be light! When the Universe was just a few hundred million years old, light from the very first galaxies started to break out from the cold, obscuring hydrogen clouds (artist’s impression). First light: NASA‘s Spitzer Space Telescope managed to capture light originating from the Universe‘s very first groups of objects – either huge stars or black holes. It took a few hundred million years – the cosmic Dark Ages – before the first stars and galaxies formed. Soon, their light started to heat up the remaining gas, and the Universe was filled with light.